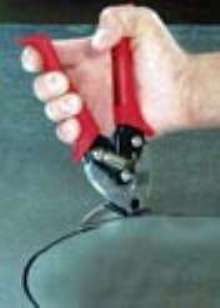 Available in both right and left cutting models, Upright Snips(TM) are compound leverage aviation snips that incorporate right angle 90Â° handle-to-blade design. They feature unbreakable forged molybdenum steel blades, threaded center pivot bolt to keep blades in adjustment, double overwind spring, soft copolymer grips, and handles with 5Â½ in. spread. Snips offer push or pull cutting motion and can be turned or rotated in hand while cutting circles.